Diamond Details: Very fine round brilliant cut and princess cut white, yellow and pink diamonds. 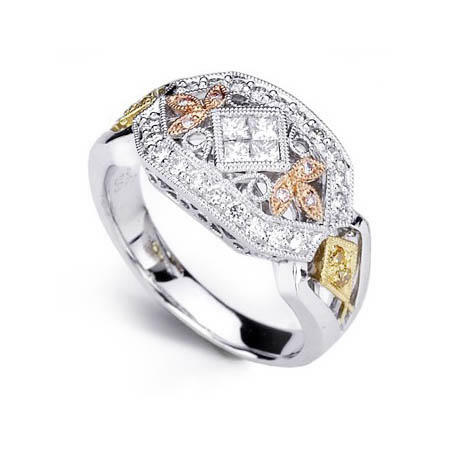 Ring Details: Simon G 18k white, yellow and rose gold with antique style caviar beading. This fascinating Simon G antique style 18k white, yellow, and pink gold wedding band ring contains very fine round brilliant cut and princess cut white, yellow and pink diamonds. Caviar beading creates the unmistakable antique style effect.